Michigan Democrats are doubling down on the war on women narrative, despite rebuttals from female GOP Senate candidate Terri Lynn Land and warnings from leading liberal thinkers that the strategy could backfire. Senate Majority Leader Harry Reid’s Super PAC is bombarding Michigan airwaves with ads calling Land’s pro-life views "radical" and "backwards." "Backwards: That’s the direction Terri Lynn Land would take Michigan women," the ad says. The Land campaign slammed the 30-second spot’s misleading claims that Land opposes birth control, saying Land has made no such claims and supports access to the pill. "Senator Harry Reid’s Senate Majority PAC is so desperate they have resorted to running demonstrably false advertisements in Michigan against Terri Lynn Land to avoid talking about Congressman Peters’ record on jobs," Land spokeswoman Heather Swift said in a statement. "This sort of D.C. political mudslinging is shameful and not welcome in Michigan." Democrats, including Land’s opponent Rep. Gary Peters and President Barack Obama, are attempting to resurrect the "war on women" narrative that worked effectively in 2012. Land, Michigan’s second female secretary of state, immediately challenged those attacks in her first campaign ad, titled "Really." "Congressman Gary Peters and his buddies want you to believe I’m waging a war on women. Really? Think about that for a moment," she says, taking a break to sip coffee. 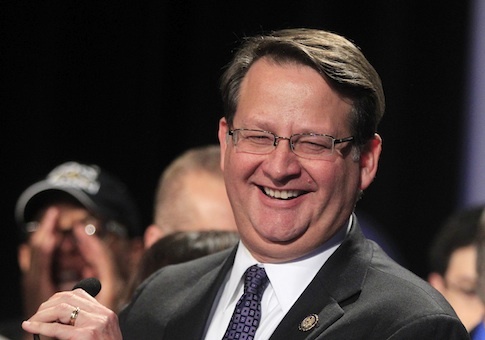 "As a woman, I might know a little bit more about women than Gary Peters." Democrats’ attempts to smear Land led liberal pundit Hanna Rosin to defend the Republican candidate, saying politicians like Peters had reduced women’s issues to "pure tactic." Rosin went on to praise Land for fighting against male-dominated unions to get "more fair work policies for her heavily female staff." "Land is nowhere near [former GOP Senate candidate Todd] Akin territory here. In fact she’s totally right," Rosin said. Rosin’s criticism fell on deaf ears among Democrats. Reid’s Super Pac is spending $600,000 on the anti-Land ad. The Land campaign said that the latest ad highlighted the lengths Peters and Democrats will go to avoid talking about the economy. "From his support of Obamacare and opposition to Keystone, few Washington politicians have been on the wrong side of policies that grow jobs in Michigan as Congressman Peters," Swift said in the statement. Reid’s Super PAC remains a top fundraiser for Peters, who has struggled to match Land’s fundraising momentum. The Democrat has raised $1 million less than Land, despite a nearly $200,000 haul from leadership PACs, according to the Center for Responsive Politics. Peters is not just benefitting from six-figure contributions: the "Backwards" commercial is the third attack ad the PAC has launched in Michigan. The Michigan race to replace retiring Democrat Sen. Carl Levin will be crucial in determining Senate control in 2014. Despite the fact that Obama won Michigan by 10 points in 2012, statewide polls show Land running dead even with Peters, according to Real Clear Politics. The Peters campaign did not respond to requests for comment. This entry was posted in Politics and tagged 2014 Election, Gary Peters. Bookmark the permalink.